A Yule Log or Bûche de Noël (BOOSH duh noh-EHL) is a special dessert for a special occasion - Christmas. This dessert was invented by a French pastry chef in the late 1800s. While there are many recipes for this traditional Christmas dessert, my version uses a deliciously light and moist chocolate sponge cake, that is filled with chocolate whipped cream, rolled into a cylinder, and then frosted with chocolate ganache. You can dust the top of the cake with powdered sugar (to simulate snow). 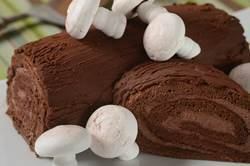 I also like to pile lots of sweet homemade meringue mushrooms on top and around the Yule Log for everyone to nibble on. Bo Friberg in his book 'The Professional Pastry Chef' gives us a little history on the Yule Log. He tells us that it was a tradition, dating from pre-Christian times, to honor the God Thor and to celebrate the Winter Solstice with the building of a bonfire. The story goes, that as Christmas came to replace the Winter Solstice celebrations, France carried on the tradition for a 'yule' log by cutting down a tree each year and then placing it in the fireplace so the heat from the log could be used to prepare the Christmas Eve midnight supper. The ashes from this 'yule' log were believed to hold magical and medicinal powers that would ward off the evil spirits in the coming year. The tradition of substituting a real 'yule' log with a dessert 'Yule' Log (Bûche de Noël) was probably started when homes were built without fireplaces so they could not burn a real 'yule' log. Chocolate Sponge Cake: Preheat your oven to 450 degrees F (230 degrees C) and place the oven rack in the center of your oven. Butter, or spray with a nonstick vegetable spray, a 17x12 inch (43x30 cm) baking pan, line it with parchment paper, and then butter and flour the paper (or spray with a nonstick vegetable/flour spray). In a bowl, whisk the flour with the cornstarch, cocoa powder, and salt. Next, remove 1 tablespoon (15 grams) of the granulated white sugar called for in the recipe and set it aside. It will be added to the whipped egg whites. Then, place the two eggs and three egg yolks, along with the remaining granulated white sugar and vanilla extract, in the bowl of your electric mixer, fitted with the whisk attachment (can use a hand mixer). Beat on high speed until the mixture is thick, pale yellow, and fluffy (this will take about five minutes). (When you slowly raise the beaters the batter will fall back into the bowl in a slow ribbon.) Sift half the flour mixture over the beaten egg mixture and fold in gently with a rubber spatula, just until the flour is incorporated. Sift the remaining flour mixture into the batter and fold in. In a clean bowl, with the whisk attachment, (or with a hand mixer) beat the egg whites and cream of tartar, on medium low speed, until soft peaks form. On high speed, gradually add the one tablespoon (15 grams) sugar and beat until stiff peaks form. Gently fold a little of the whites into the batter to lighten it, and then fold in the rest of the whites. Pour the batter into your prepared pan, spreading evenly with an offset spatula or back of a spoon. Bake for about 6 - 8 minutes, or until set, and when the top of the cake is lightly pressed, it springs back (a toothpick inserted into the center of the cake will come out clean). Immediately upon removing the cake from the oven, sprinkle the top of the cake with some powdered sugar and then invert the cake onto a clean dish towel (the powdered sugar will prevent the cake from sticking to the towel). Remove the parchment paper, sprinkle the top of the cake with powdered sugar, and gently roll up the sponge cake, with the towel (this helps prevent cracking and sets the log shape). Place on a wire rack to cool. Chocolate Frosting: Place the chopped chocolates in a medium sized heatproof bowl. Heat the cream and butter in a small saucepan over medium heat. (Can also heat the cream and butter in the microwave.) Bring just to a boil. Immediately pour the boiling cream over the chocolate and stir gently (as you do not want to incorporate too much air into the mixture) with a spoon or whisk until smooth. Set aside until it thickens to spreading consistency (this may take a couple of hours). Chocolate Whipped Cream: In a large mixing bowl, fitted with the whisk attachment (can use a hand mixer), place the whipping cream, vanilla extract, sugar, and cocoa powder and whisk to combine. Then beat the mixture, on high speed, until stiff peaks form. Once the cake has cooled, unroll, spread with the cream and then gently roll the cake back into a log shape. Next, cut about a 1 - 1 1/2 inch (2.5 - 3.75 cm) diagonal slice from one end of the cake and, using a little of the frosting, attach it to one side of the cake (so it looks like a tree limb). Then cut a slice straight across the cake (to make the cake even) and again, use a little of the frosting, attach it to the other side of the cake (so you have two tree limbs). Frost the top and sides of the cake with the remaining frosting. If you like you can run the tines of a fork through the frosting so it looks like the "bark" of a tree. Cover and place in the refrigerator until serving. This cake can be stored in the refrigerator for about 4-5 days. Just before serving remove the cake from the fridge, dust the top with powdered sugar (for snow) and decorate with meringue mushrooms, if using. Note: You can make chocolate truffles from any leftover chocolate frosting. First, cover and refrigerate the chocolate frosting until firm. Then form into small balls and roll in cocoa powder, confectioners (powdered or icing) sugar or chopped nuts. You can use your hands to form the truffles, a melon baller or small spoon. Truffles can be refrigerated for a couple of weeks or else frozen for a couple of months.